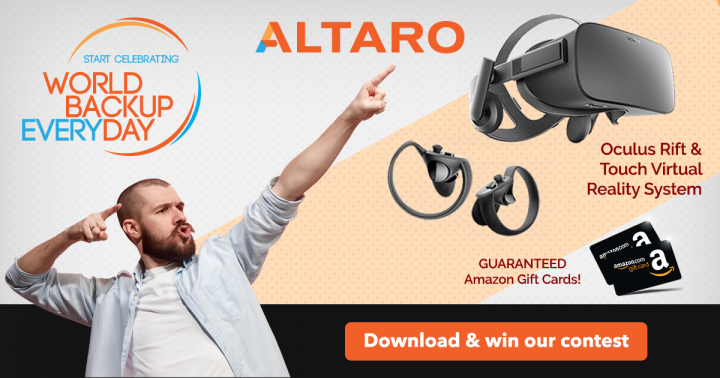 Altaro is organizing a contest where you can win Oculus Rift + Touch Virtual Reality System. In fact, World Backup Day is a day for people to learn about the increasing role of data in our lives and the importance of regular backups. Without regular backups, your data are at risk. Ransomware, cryptolockers… all kind of threads are spreading multiple ways today. Your work network, your home PCs, everything shall be protected if you store valuable data. 10 years ago there were much fewer threads and there was much less risk and fewer data to protect. The size of data explodes and the criticality of backups is a question of life. Click here, download Altaro, install it. Take a screenshot of your dashboard. Each valid submission (screenshot of the main dashboard running + at least 1 of your VMs added) is automatically rewarded with a €20 Amazon eGift Card.